This is one of my favorite salads and is tasty and healthy. It has no salad dressings or mayonnaise and it’s still tasty. Here is the recipe for a Low Fat Lettuce and Chicken Salad. Lightly fry the cooked chicken breast pieces on a non stick skillet for 4-5 minutes till it begins to brown. Take lettuce, cucumber and tomatoes along with salt and pepper in a bowl and mix thoroughly. Use your hands or a salad spinner for mixing everything. This will enhance the flavor and is required as we are not using any dressings. Add the browned chicken pieces and combine everything well. You can buy cooked chicken breasts from your grocery store and many brands are available like Perdue, Tyson etc. If you are cooking chicken breasts at home, you can poach, boil, bake, grill or roast. There are many recipes available for cooking chicken breasts. I generally bake boneless and skinless chicken pieces after marinating with salt, pepper, ginger, garlic and lemon juice. I bake it at 400 degree F for 30-40 minutes and shred it after cooling. 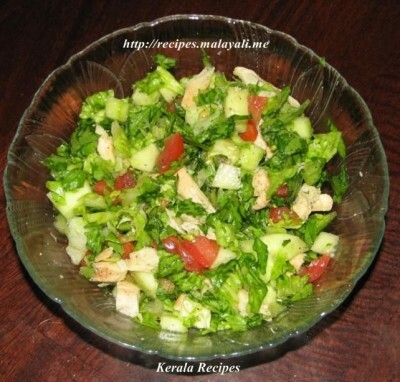 Haven’t seen Romaine Lettuce much in Kerala.. Where can I get them? I am not sure if you will find Romaine Lettuce in India. Ordinary Lettuce itself seems to be expensive and can be found at Reliance Fresh and other supermarkets. I would like to try your recipe out..